While literary trends tend to be a little unpredictable, the popularity of dystopian YA (young adult) novels has steadily soldiered on. As it turns out, post-apocalyptic doom and gloom and the full depth of human misery is still fashionable. Trouble is, with so many titles crowding the shelves it’s not always easy to separate the proverbial wheat from the chaff, the truly original offerings from the slew of Hunger Games or Divergent knockoffs. Thankfully, some authors, like Krista McGee make the job easy with the first novel in what’s a very promising series. With Anomaly, McGee not only breathes new life into the genre with a storyline that immediately grabs your attention and doesn’t let go, but she seamlessly weaves in spiritual parallels without being shamelessly preachy in the process. Following the destruction of the rest of the human race on the surface of Earth, Thalli now resides in an underground compound with a small group of her fellow humans. Adding an intriguing layer to her new life is that humans no longer have emotional capabilities in their DNA. Instead, everything is structured, monitored, and no one even thinks of questioning anything because it doesn’t even occur to anyone to do so. But in what’s become a strangely robotic world where little is ever as it seems, Thalli has a troubling secret. For whatever reason, the absence of feelings and common reasoning skills hasn’t reached her. Forced to hide her discovery, lest she face Annihilation, it’s a daily struggle to live in a way that doesn’t feel the least bit natural. In a sea of copycats, Anomaly brims with originality and a fresh approach to such a well-worn narrative. Not only does McGee craft a compelling series of characters the reader can’t help rooting for, but the plotting, which includes an ending I didn’t see coming, a rarity for any regular reader, in nothing short of engaging. If anything, it’ll just make you long for the sequel, which isn’t slated to hit stores until early next year. 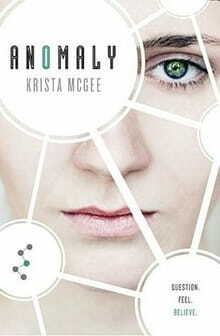 But in the meantime, McGee drags the reader into a strange new world with Anomaly, a thrilling reminder that creativity is still alive and well, even in a genre that’s beginning to feel a little too familiar.